St. Anastasius I was born in Rome. He was the son of Maximus. We know little about him, but he was Pope from November 27, 399 to December 19, 401. We also know that he condemned the writings of the Alexandrian Theologian Origen, shortly after their translation into Latin. He fought against these writings throughout his papacy, and in 400 he called a council to discuss them. The council he assembled agreed that Origen was not faithful to the Catholic Church. During his reign we also know he encouraged Catholics in North Africa to fight Donatism. It was Pope Anastasius who instructed Priests to stand and bow their head as they read from the Gospels. Among his many friends were Augustine, Jerome and Paulinus. St. Jerome speaks of him as a man of great holiness who was rich in his poverty. St. Anastasius was succeeded by his son, Pope Innocent I, who was born before Anastasius entered the Clergy. Pope St. Anastasius is buried in the Catacomb of Pontian. 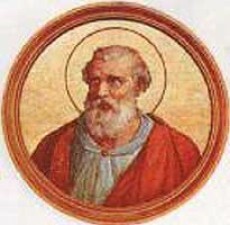 Pope St. Anastasius I, was a an early saint of the Church. We are not sure when he was born, but we know his papacy was only 25 months long, and he passed in 401. We also know he spent his time in the papacy defending the Catholic Faith, and he found the Alexandrian theologian, Origen, to be teaching agains the Catholic faith. He held a council and his decision was upheld. We also know that his son followed him as Pope Innocent I, a child of his prior to his entering the Clergy.